Serbia! 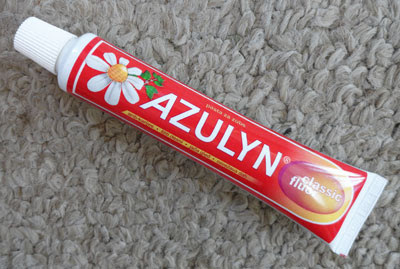 This toothpaste is from the Republic of Serbia. The packaging is bilingual with most of the words in Serbian. It's a mild minty paste with flouride. The distinctive addition is camomile. Health benefits abound, for sure. Herbal teas that are designed to sooth the mind often have camomile as a key ingredient. Thanks to Google Translate, I was able to discover the touted benefits of this particular paste: it will provide protection against decay, protection from gum disease, strengthen tooth enamel and refresh your breath. I like the flavor. It's not as sweet as most American pastes. It's very slightly blue-green in color - kind of like they mixed one part Crest with six parts white paste. It's made in Germany for the Serbian market by Schwarzkopf & Henkel, which is a giant manufacturer of health and beauty products.